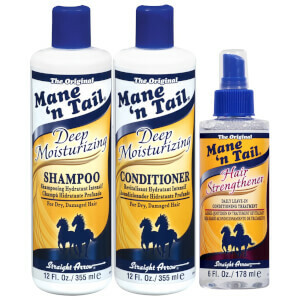 Rejuvenate locks with the Mane 'n Tail Hair Strengthening 3 Pack Kit; a three-piece set of haircare treats that revives dry, damaged locks with intense moisture and nourishment. 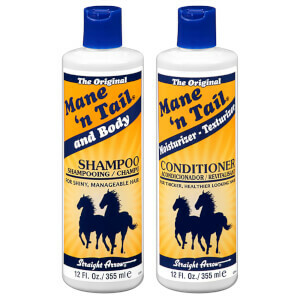 An innovative horse to human crossover range that was originally created to keep your pony’s hair soft and shiny, the three-piece set harnesses the same benefits, cleansing, moisturising, nourishing and strengthening locks whilst fighting frizz and offering UV and thermal protection. Achieve fuller, stronger and healthier-looking hair with the high-performance trio. A leave-in conditioning treatment that works to moisturise, rejuvenate and calm unruly locks. Lightweight and non-greasy, the protective, alcohol-free spray defends against chemical and heat styling, whilst preventing breakage and split ends to leave hair soft, smooth and healthy-looking. Effortlessly detangles hair and controls frizz for a salon-style finish. Treatment: Spray onto dry or damp hair. Comb through to distribute evenly throughout hair. No need to rinse. Style as desired. Treatment: Water/Aqua/Eau, Propylene Glycol, Isostearamidopropyl Morpholine Lactate, DMDM Hydantoin, PEG-12 Dimethicone, Polyquaternium-11, Fragrance (Parfum), Polysorbate 20, Hydrolyzed Keratin, Aloe Barbadensis, Hydrolyzed Silk Protein, Polysorbate 80, Allantoin, Niacin, Panthenol, Retinyl Palmitate, with Extracts of*: Aesculus Hippocastanum (Horse Chestnut) Seed*, Equisetum Arvense (Horsetail) Leaf*, Larrea Divaricata (Chaparral)*, Spiraea Ulmaria (Meadowsweet) Flower*, Trifolium Pratense (Red Clover) Flower*, Tussilago Farfara (Coltsfoot) Flower*, Tocopherol, Cinnamal, Coumarin.